”Oh my soul is so happy. “In Vastervik it was bitter cold and pouring down rain. I wanted to go swimming, but Charlie convinced me to go hiking instead. We might as well have been swimming - we were soaked through before too long. I was too happy to notice and Charlie was too busy looking for rune stones. He never did find any. But he did find a few unimpressive piles of stone which I’m sure were ancient monuments. Charlie’s trail map wasn’t very clear. And we didn’t know what “fornlämning” meant at the time. ”After visiting the castle in Kalmar, we drove over to Borgholm and parked near a beach. Together, we jumped into ridiculously cold seawater, thrashed about to prevent hypothermia, and scrambled back onto the dock to dry off. I had a couple of flashbacks to swimming at Onset Island…. Next, we combed the beach for anything of interest. Crabs - none. Shells - none. Moon jellyfish - 1. Seaweed - plenty. The boat on the far right was our home for three nights. homemade Swedish crepes for brekky? mmmm yes please. A giant snail I almost stepped on. They were EVERYWHERE. A hen house that was converted into an Airbnb. Tiny and sweet and comfortable. Me. 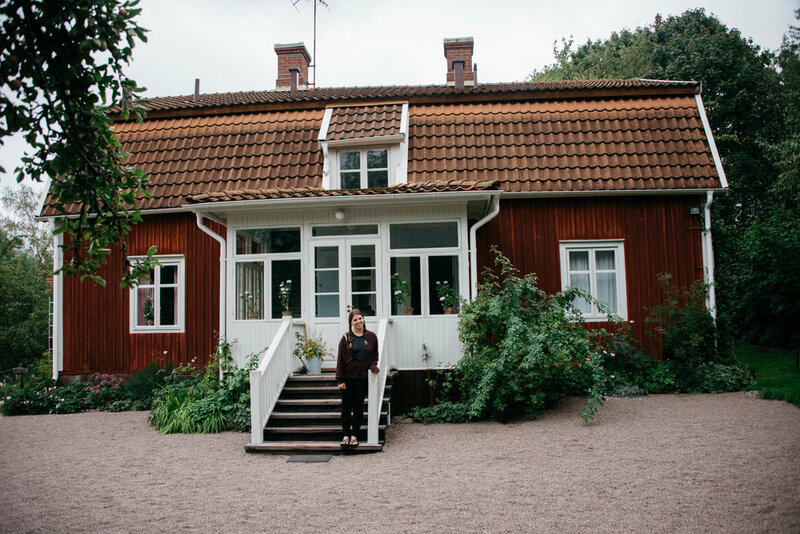 In front of Astrid Lindgren’s childhood home in Vimmerby. we didn’t get very many photos together - but this one is a favorite of mine.